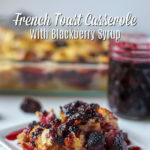 This Baked French Toast Casserole with blackberry maple syrup is an easy make-ahead breakfast, perfect for holidays, brunch, or just an easy morning meal. 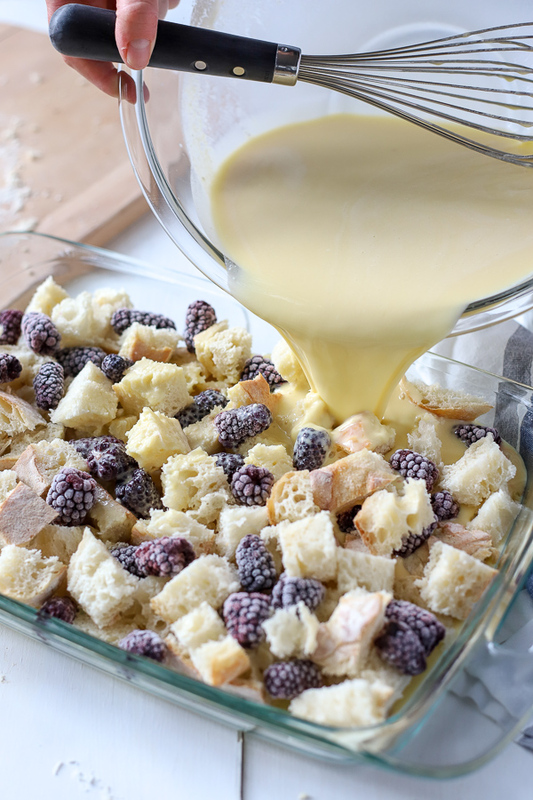 Crusty bread is baked in a lightly-sweetened creamy custard with juicy blackberries, then topped with blackberry syrup. The tart and sweet blackberries add an extra layer of flavor, perfectly complementing the creamy custard. I promise this will be a family favorite and would make the perfect holiday breakfast or brunch. Follow my tips below to make the best baked french toast casserole! 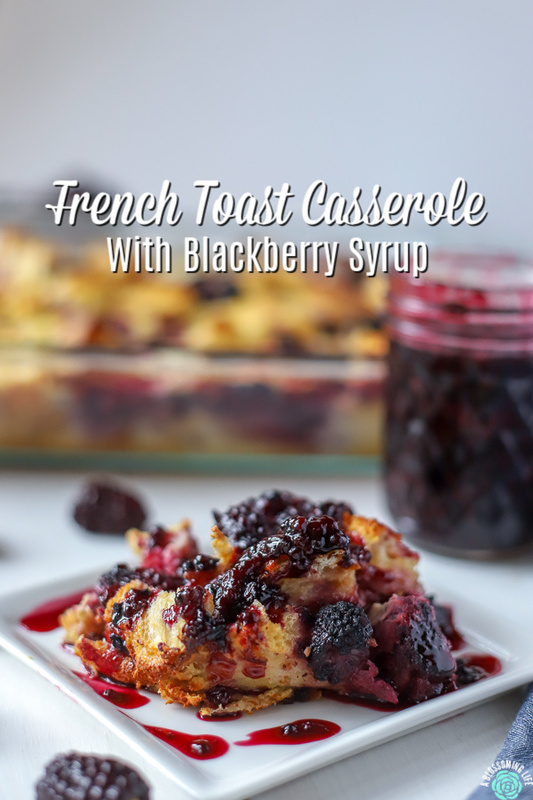 To make the french toast casserole, you will need: one loaf of crusty bread (i.e sourdough), eggs, milk of choice, plain Greek yogurt, maple syrup, vanilla, salt, and blackberries. To make the delicious blackberry maple syrup, you will need: frozen blackberries, maple syrup, vanilla, cornstarch. This post is sponsored by the Oregon Blackberry and Raspberry Commission. All opinions are my own. I’m not sure how it happened, but we are coming up on our two-year anniversary of moving to Oregon. Y’all, these last two years have completely flown by. Between exploring what Oregon has to offer to having our sweet Ari man join our family (who is also about to turn one! ), it has been a whirlwind. Over the last two years we have had so much fun, have met so many amazing people, and have picked so much amazing food. If you’ve never been to Oregon, it is seriously an amazing place, and the food here is perfection. During our first summer in Oregon, we went to an antique store, and the sweetest lady there showed us around her little farm. She let us pick a few fruits from her trees and gave us our first taste of Oregon blackberries and marionberries. 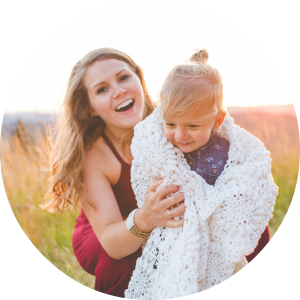 We left there with full bellies, and August’s face was completely purple and red from all the juicy berries she tried to pop into her mouth… and missed. Clearly, she enjoyed them. Oregon blackberries are the best! And did you know that 90% of frozen US grown blackberries are from Oregon? Doesn’t surprise me one bit, as Oregon has the perfect climate for growing blackberries, and you can find them just about everywhere, even growing wild on the side of the road! Frozen fruit is one of our favorite foods of all time. Every night before bed, we wrestle the kids into our bed and we all enjoy a snack of frozen fruit while we read books. It really is a special time we enjoy every night. August always begs for Oregon blackberries. When we have the willpower to set aside some frozen fruit from our snack stash, we like to bring some summer flavor to our food year-round. 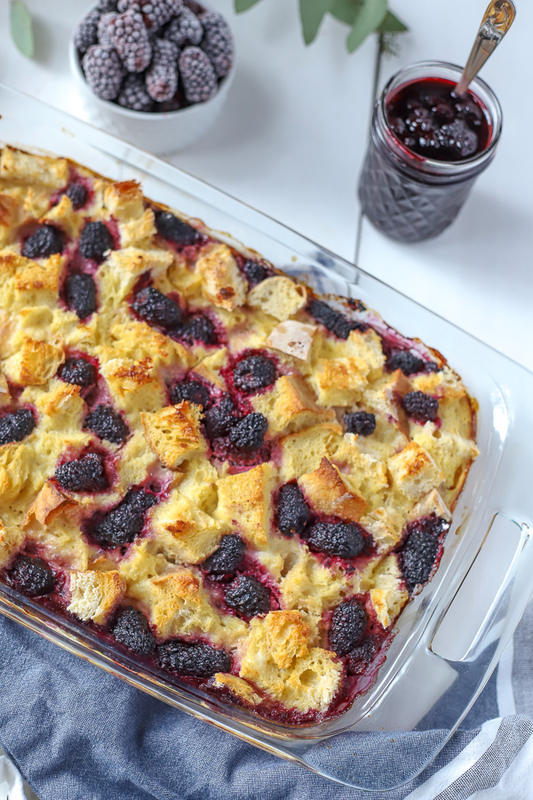 Frozen blackberries also make this French toast casserole something you can make year-round, instead of just in summertime! Seriously, this would be the perfect holiday breakfast. 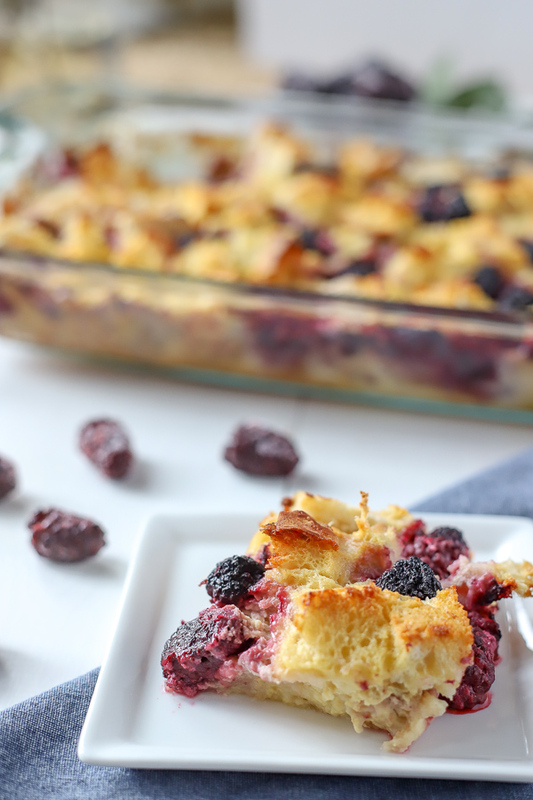 This baked French toast casserole is so good. We have eaten it for breakfast, snacks, and dessert, and even left over cold, it was still amazing. It’s so delicious and easy to whip up. And did I mention that it is healthy? Yep, there is no refined sugar, and only whole, real-food ingredients. Plus, blackberries are packed with vitamin C, vitamin K, and fiber, so you can feel great about eating this breakfast, even though it tastes like dessert! And y’all, the topping… The blackberry syrup is seriously YUM. I could put this on just about everything. Pancakes, ice cream, toast… it is SO good, and it’s totally worth the tiny bit of extra effort to make instead of just pouring on plain maple syrup (which would honestly still be delish). 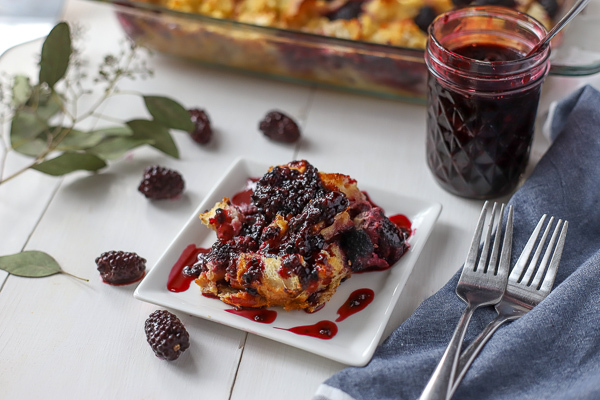 The blackberry syrup brings the amazing berry flavor to a whole new level. To give this baked French toast casserole an extra-thick custard filling, this recipe includes whole-milk Greek yogurt. This is not your typical French toast casserole, my friends. Really, it should be called custard French toast. The custard puts it in a whole new category of food – it’s bigger than just breakfast. You can eat it warm and even cold. Which may have happened, and it’s even delicious then. A friend taste-tested it cold, and she said it was so good, she wasn’t sure she even wanted to try it warm. Use crusty bread, like sour dough, French bread, etc. Day-old bread works also. Soft bread will yield a soggy casserole – especially if you try to soak it overnight. Let the bread soak in the custard for about 30 minutes. I preferred it this way as it gave the french toast casserole the best custardy texture. If you use fresh bread, I would only let it soak for 30 minutes to an hour to ensure it doesn’t get soggy. Depending on the bread you use, you may not need all the custard mixture. Use your eyes to gage it. To get the blackberries everywhere, add a layer of bread, sprinkle on blackberries, and then add another layer of bread followed by blackberries. You could make this with blackberries, raspberries, and/or marionberries. You could also make this on the weekend, and then use the leftovers for a quick weekday breakfast; just pop a piece in the toaster oven or microwave. Since we have neither of those things, we just used a skillet and chopped it up into small pieces and heated it up with a little bit of butter. Delicious. 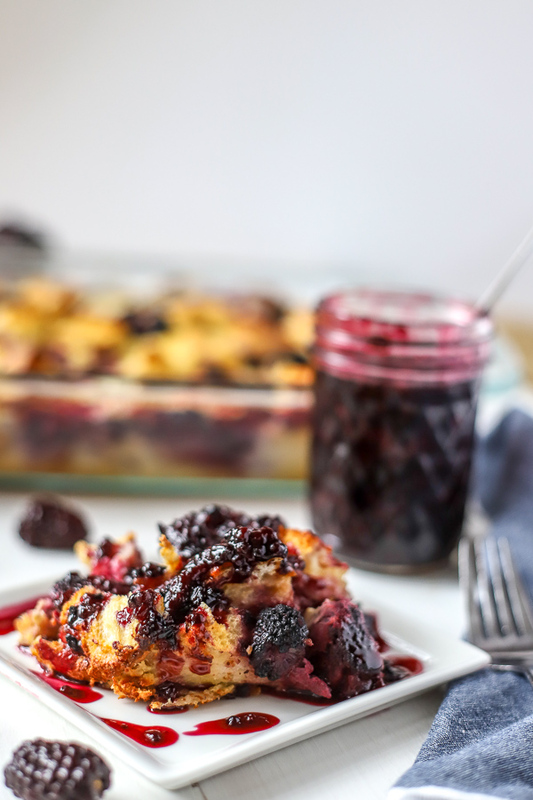 You really can’t go wrong with this French toast casserole. 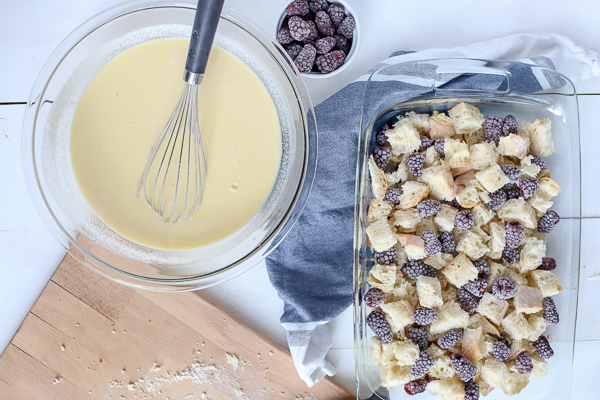 Crusty bread is baked in a lightly-sweetened creamy custard with blackberries, then topped with blackberry syrup. In a large bowl, whisk together eggs, yogurt, milk, vanilla, and maple syrup together. Set aside. Cut bread into strips and layer half into a 9x13 pan. Scatter 1 cup frozen blackberries throughout bread, then layer remaining bread, and top with remaining frozen blackberries. Pour custard over top. Allow to soak in; refrigerate at least 30 minutes to an hour. Preheat oven to 350. Lightly pat down any bread that floated up a bit. Place into oven for 45 minutes to an hour. Over medium heat, add blackberries and maple syrup and bring to a boil. Allow to simmer for 5-10 minutes. In a small cup, make a slurry with cornstarch and vanilla. Pour into blackberry maple syrup mixture, bring to a boil for a minute until thickened, and then take off of heat to cool. Store in the refrigerator for 4-7 days. If it lasts that long. Some loafs are smaller than others. If you loaf is on the smaller size you may need to use less of the custard mixture. Have you ever had Oregon blackberries? What’s your favorite way to eat them? Thank you Oregon Blackberry and Raspberry Commission for sponsoring this post. YUM! That looks so good. Perfect yummy breakfast ! I love that you can use frozen berries! I will definitely put this on my breakfast menu this holiday season! Thank you! Me too. Makes it so easy since we always keep frozen berries on hand! Oooohhhh this casserole is so perfect! Love all of that blackberry goodness. This would be so fun for Christmas breakfast. Thank you Emily! My kids would love this recipe and would be perfect for Christmas morning.